This is the top selling harness for disabled dogs! It is the ideal aid for dogs with hip arthritis, hip dysplasia or neurological problems. It offers security, stability and support for dogs with mobility problems in both front and hind legs. 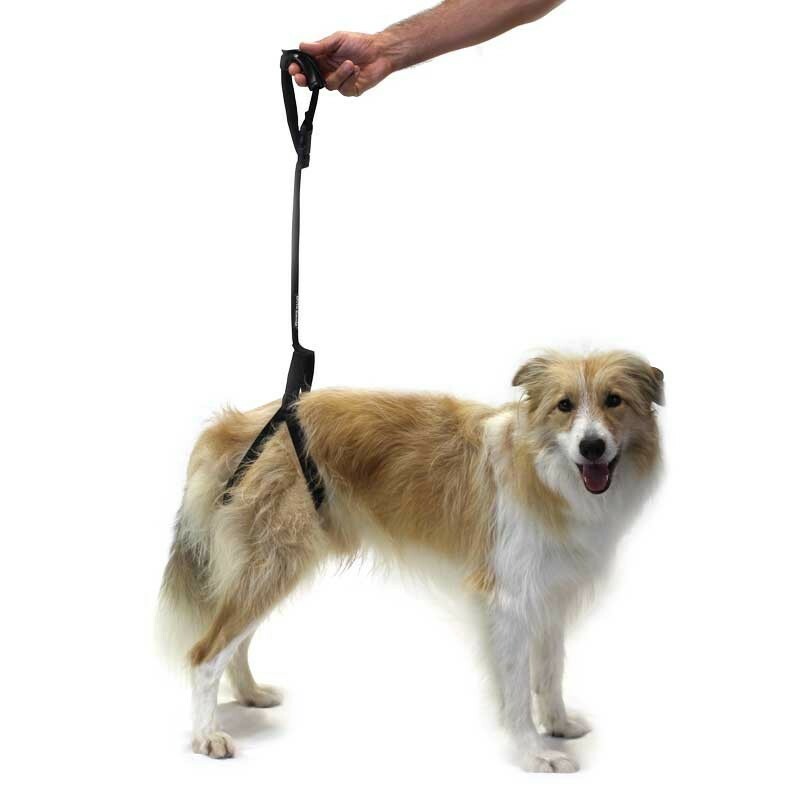 Both the dog's leash and harness can be held wth the same hand. This harness can give support to both the front and the back legs in dogs with hip dysplasia, arthritis and other locomotor dysfunctions. It is comfortable and light-weight. Stop having to bend down in order to help your pet stand up or walk. -Use the harness as a supplement to the collar. -For very small dogs remove the padded protection. -For bigger dogs remove the buckle in order to increase the diameter of the strap. Try to keep your dog as still as you can. Place your dog's legs in the padded loops (if the dog is very small, take off the pads) and adjust them with the help of the buckles. Hold the leash and adjust it to the right height. The first time you put on the harness it may seem slightly complicated, however once it has been adjusted you will see that it becomes very easy. Moreover, when dogs realize that the harness helps them to walk better and relieves their pain, they will let you put the support on easily and will even help you out. The new harnesses are available in black. If your dog weighs less than 4 kg (9 lbs) or more than 45 kg (100 lbs), you may be interested in our other models of dog harnesses. We are constantly improving our products, as such the pictures may not always coincide with the product you receive.